See our easy home canning recipes for your excess fruit with step-by-step instructions and learn how to can food from your homestead and country gardens. 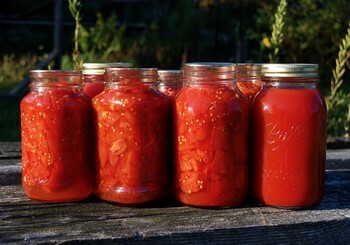 The success of home canning depends upon absolute sterilization. If the proper care is taken you shouldn't have any failures, except in rare cases, when a spore has developed in the can. When this happens your cans have become spoiled and you will have to throw the contents away. I like canning fruit particularly, as you can always freeze excess vegetables, but you cannot always freeze excess fruit as easily. 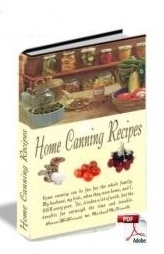 Canning allows me to save my fruit and use it in pies, dessert recipes, ice-cream recipes, jams and jellies. The quantity of sugar may be increased if you like your fruit sweet. I don't, but then that is a matter of personal preference. It is most important that the jars, covers, and rubber rings that you use for canning are in perfect condition. Examine each jar and cover to see that there is no defect in it. Use only fresh rubber rings, for if the rubber is not soft and elastic the sealing will not be perfect. Each year a number of jars of fruit are lost because of the false economy in using an old ring that has lost its softness and elasticity. Once you are sure that the jars, covers, and rings are all in perfect condition, the next thing to do is to wash and sterilize them well. Have two pans partially filled with cold water. Put some jars in one, laying them on their sides, and some covers in the other. Place the pans on the stove where the water will heat to the boiling point. The water should boil at least ten or fifteen minutes. Have on the stove a shallow milk pan in which there is about 2 inches of boiling water. Sterilize the cups, spoons, and funnel, if you use one, by immersing in boiling water for a few minutes. When you are ready to put the prepared fruit into the jars, slip a broad skimmer under the jar and lift it and drain free of water. Set the jar in the shallow milk pan and fill to overflowing with the boiling fruit. Slip a silver-plated knife or the handle of a spoon around the inside of the jar, that the fruit and juice may be packed solidly. Wipe the rim of the jar, dip the rubber ring in boiling water and put it smoothly on the jar, then put on the cover and fasten. Place the jar on a board and out of a draft of cold air. The work of filling and sealing must be done rapidly, and the fruit must be boiling hot when it is put into the jars. If screw covers are used, it will be necessary to tighten them after the glass has cooled and contracted. When the fruit is cold wipe the jars with a wet cloth. Paste on the labels, if any, and put the jars on shelves in a cool, dark closet. Should you add extra Sugar to your Home Canning Recipes? In home canning, any proportion of sugar may be used, or fruit may be canned without the addition of any sugar. However, that which is designed to be served as a sauce should have the sugar cooked with it. Fruit intended for cooking purposes need not have the sugar added to it. Should you add water in your Home Canning Recipes? 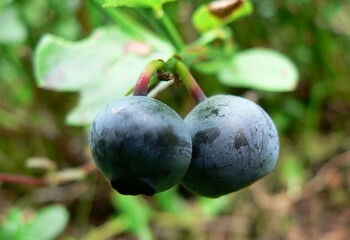 Juicy fruits, such as berries and cherries, require little or no water. Strawberries are better not to have water added to them. The only exception to this is when they are cooked in a heavy syrup. Put 8 cups of the fruit in the preserving kettle; heat slowly on the stove; crush with a masher; spread a square of cheese cloth over a bowl, and turn the crushed berries and juice into it. Press out the juice, which turn into the preserving kettle. Add the sugar and put on the stove; stir until the sugar is dissolved. When the syrup begins to boil, add the remaining 40 cups of berries. Let them heat slowly. Boil ten minutes, counting from the time they begin to bubble. Skim well while boiling. Put in bottles and seal as directed. Heat, crush, and press the juice from the currants and proceed as directed for raspberries. 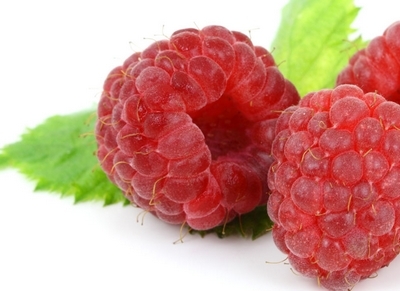 Treat the same as for raspberries. For green gooseberries dissolve the sugar in the water, then add the fruit and cook fifteen minutes. Ripe gooseberries are to be treated the same as the green fruit, but use only half as much water. Green gooseberries may also be canned the same as rhubarb. See below. Put water, berries, and sugar in the preserving kettle; heat slowly. Boil fifteen minutes, counting from the time the contents of the kettle begin to bubble. Measure the cherries after the stems have been removed. Stone them or not, as you please. If you stone them be careful to save all the juice. Put the sugar and water in the preserving kettle and stir over the heat until the sugar is dissolved. Put in the cherries and heat slowly to the boiling point. Boil ten minutes, skimming carefully. Squeeze the pulp of the grapes out of the skins. Cook the pulp five minutes and then rub through a sieve that is fine enough to hold back the seeds. Put the water, skins, and pulp into the preserving kettle and heat slowly to the boiling point. Skim the fruit and then add the sugar. Boil fifteen minutes. Sweet grapes may be canned with less sugar; very sour ones may have more. Cut the rhubarb when it is young and tender. Wash it thoroughly and then pare; cut into pieces about 2 inches long. Pack in sterilized jars. Fill the jars to overflowing with cold water and let them stand ten minutes. Drain off the water and fill again to overflowing with fresh cold water. Seal with sterilized rings and covers. When required for use, treat the same as fresh rhubarb. Green gooseberries may be canned in the same manner. Rhubarb may be cooked and canned with sugar in the same manner as gooseberries. Put the sugar and water together and stir over the heat until the sugar is dissolved. When the syrup boils skim it. Draw the kettle back where the syrup will keep hot but not boil. Pare the peaches, cut in halves, and remove the stones, unless you prefer to can the fruit whole. Put a layer of the prepared fruit into the preserving kettle and cover with some of the hot syrup. When the fruit begins to boil, skim carefully. Boil gently for ten minutes, then put in the jars and seal. If the fruit is not fully ripe it may require a little longer time to cook. It should be so tender that it may be pierced easily with a silver fork. It is best to put only one layer of fruit in the preserving kettle. While this is cooking the fruit for the next batch may be pared. If the fruit is ripe it may be treated exactly the same as peaches. If, on the other hand, it is rather hard it must be cooked until so tender that a silver fork will pierce it readily. Rub the fruit hard with a coarse, crash towel, then wash and drain. Pare, quarter, and core; drop the pieces into cold water. Put the fruit in the preserving kettle with cold water to cover it generously. Heat slowly and simmer gently until tender. The pieces will not all require the same time to cook. Take each piece up as soon as it is so tender that a silver fork will pierce it readily. Drain on a platter. Strain the water in which the fruit was cooked through cheese cloth. Put two quarts of the strained liquid and the sugar into the preserving kettle; stir over the fire until the sugar is dissolved. When it boils skim well and put in the cooked fruit. Boil gently for about twenty minutes. * 24 cups of sliced apples. Put the sugar and water into the preserving kettle. Stir over the fire until the sugar is dissolved. When the syrup boils skim it. Wash the fruit, rubbing the blossom end well. Put it in the boiling syrup, and cook gently until tender. It will take from twenty to fifty minutes, depending upon the kind of crab apples. Nearly all kinds of plums can be cooked with the skins on. If it is desired to remove the skin of any variety, plunge them in boiling water for a few minutes. When the skins are left on, prick them thoroughly to prevent bursting. Put the sugar and water into the preserving kettle and stir over the fire until the sugar is dissolved. Wash and drain the plums. Put some of the fruit in the boiling syrup. Do not crowd it. Cook five minutes; fill and seal the jars. Put more fruit in the syrup. Continue in this manner until all the fruit is done. It may be that there will not be sufficient syrup toward the latter part of the work; for this reason it is well to have a little extra syrup on the back of the stove. 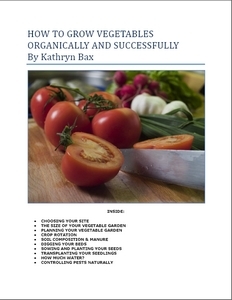 Wash the tomatoes and plunge into boiling water for five minutes. Pare and slice, and then put into the preserving kettle; set the kettle on an iron ring. Heat the tomatoes slowly, stirring frequently from the bottom. Boil for thirty minutes, counting from the time the vegetable begins actually to boil. Put in sterilized jars and seal. Put the pared and sliced tomatoes into a pot and cook as directed for stewed tomatoes. When they have been boiling twenty minutes remove from the heat and rub through a strainer. Return to the stove. While the sliced tomatoes are cooking, pare the whole tomatoes and put them in sterilized jars. Pour into the jars enough of the stewed and strained tomato to fill all the interstices. Put the uncovered jars in a moderate oven, placing them in shallow pans of hot water. Let the vegetable cook in the oven for half an hour. Take from the oven and fill to overflowing with boiling hot, strained tomato, then seal. If there is any of the strained tomato left, can it for sauces. This method of home canning fruit, is easily and quickly done, and the fruit retains its shape, color, and flavor better than when cooked in the preserving kettle. Put into the oven shallow pans in which there are about two inches of boiling water. Sterilize the canning jars and utensils. Make the syrup; prepare the fruit the same as for cooking in the preserving kettle. Fill the hot jars with it, and pour in enough syrup to fill the jar solidly. Run the blade of a silver-plated knife around the inside of the jar. Place the canning jars in the oven, in the pan of water. The oven should be moderately hot. Cook the fruit ten minutes; remove from the oven and fill the jar with boiling syrup. Wipe and seal. Place the canning jars on a board and out of a draft of air. If the screw covers are used tighten them after the glass has cooled. Large fruits, such as peaches, pears, quinces, crab apples, etc., will require about a pint of syrup to each quart jar of fruit. The small fruit will require a little over half a pint of syrup. The amount of sugar in each quart of syrup should be regulated to suit the fruit with which it is to be used. The quantities given will not make the fruit very sweet. The quantity of sugar may be increased or diminished to suit the taste. Prepare the fruit and syrup as for cooking in the oven. Fill the sterilized canning jars and put the covers on loosely. Have a cake rack at the bottom of the pot. Put in enough warm water to come to about 4 inches above the rack. Place the filled canning jars in the boiler, but do not let them touch one another. Pack clean white cotton rags, or perhaps better, cotton rope, between and around the jars to prevent them from striking one another when the water begins to boil. Cover the boiler and let the fruit cook ten minutes from the time the water surrounding it begins to boil. Draw the boiler back and take off the cover. When the steam passes off take out one jar at a time and place in a pan of boiling water beside the boiler, fill up with boiling syrup, and seal. Put the jars on a board and do not let cold air blow upon them. If screw covers are used tighten them when the glass has cooled and contracted. In the case of most fruits, canning with a little sugar is to be preferred to preserving with a large quantity of sugar. There are, however, some fruits that are only good when preserved with a good deal of sugar. Of course, such preparations of fruit are only desirable for occasional use. The fruits best adapted for preserving are strawberries, sour cherries, sour plums, and quinces. Such rich preparations should be put up in small jars or tumblers. Use equal weights of sugar and strawberries. Put the strawberries in the preserving kettle in layers, sprinkling sugar over each layer. The fruit and sugar should not be more than 4 inches deep. Place the kettle on the stove and heat the fruit and sugar slowly to the boiling point. When it begins to boil skim carefully. Boil ten minutes, counting from the time the fruit begins to bubble. Pour the cooked fruit into platters, having it about 2 or 3 inches deep. Place the platters in a sunny window, in an unused room, for three or four days. In that time the fruit will grow plump and firm, and the syrup will thicken almost to a jelly. Put this preserve, cold, into jars or tumblers. Select large, firm fruit, remove the stems, and proceed as for strawberries. The sour cherries, such as Early Richmond and Montmorency, are best for this preserve. Remove the stems and stones from the cherries and proceed as for strawberry preserve. Put the currants in the preserving kettle and on the heat. When they boil up crush them and strain through cheese cloth, pressing out all the juice. Stem and stone the cherries, being careful to save all the juice. Put the cherries, fruit juice, and sugar in the preserving kettle. Heat to the boiling point and skim carefully. Boil for twenty minutes. Put in sterilized jars or tumblers. This gives an acid preserve. The sugar may be doubled if richer preserves are desired. Prick the fruit and put it in a preserving kettle. Cover generously with cold water. Heat to the boiling point and boil gently for five minutes. Drain well. Put the sugar and water in a preserving kettle and stir over the heat until the sugar is dissolved. Boil five minutes, skimming well. Put the drained greengages in this syrup and cook gently for twenty minutes. Put in sterilized jars. Other plums may be preserved in the same manner. The skins should be removed from white plums. Boil the fruit in clear water until it is tender, then skim out and drain. Put the 8 cups of sugar and 4 cups of water in the preserving kettle; stir until the sugar is dissolved. Let it heat slowly to the boiling point. Skim well and boil for twenty minutes. Pour one-half of the syrup into a second kettle. Put one-half of the cooked and drained fruit into each kettle. Simmer gently for half an hour, then put in sterilized jars. The water in which the fruit was boiled can be used with the parings, cores, and gnarly fruit to make jelly. You can Add your Own Home Canning Recipes! We have lots of pages where you can contribute to throughout this website. We love hearing from our readers, and hope you will be one of those we hear from too. Look around our homesteading website. Submit your own home canning recipes here. All you have to do is type. We will do the rest!